Powers/Abilities: None. He is quite large and strong, but not superhumanly so. He is a competent swordsman and hand-to-hand combatant. Katuman formerly used the Sword that Conquers All, a blade whose origins precede that of Stygia (which had its origins before 13, 000 BC). The Sword came into possession of Shu-Onoru with the aid of the demon Helgor. This sword can shatter or melt virtually any substance on contact. It also released a trail of energy, the wake of which proved able to subdue those it contacted. (Savage Sword of Conan#3 (fb)-BTS) - Katuman was a prince of Stygia, but he was exiled from his native lands for acts of rebellion unspecified. (Conan the Barbarian I#247 (fb)-BTS) - Katuman led his followers across Shem to join the forces of Natohk, the Veiled One. Along the way, he became allied with the sorceror Shu-Onoru. Katuman and his allies stopped in Yamman, where they rested, and used his own force of arms to take control of King Irruk. Katuman allowed Irruk to remain on the throne of Yamman to keep his Shemite people from revolting. Shu-Onoru prophesized that a delegation from Khoraja would come to try to convince Katuman to fight for them, against Natohk. Katuman and Shu-Onoru thus prepared a trap for that delegation. (Conan the Barbarian I#247-248) - Conan, Red Sonja, Zula, and the rest of the Khorajan fell into the trap set in Yamman, and were brought before Katuman. Irruk tried to maintain his authority, but Katuman put him in his place. He refused the offer to fight for Khoraja, and defeated Conan and his allies--with the aid of Shu-Onoru and Helgor--when they briefly broke free. Katuman then took Red Sonja hostage, and forced Conan and Zula to fight to the death. Zula, however, used his magical skills to make it appear as he had been beheaded, but then Conan hurled Zula's head (actually just a skull from the gladiatorial arena) at Katuman. The enraged Stygian leapt into the arena himself and attacked Conan, again getting the better of him with the Sword that Conquers All. As he raised the sword to slay Conan, he was shocked by the headless body of Zula approaching him. Conan punched the stunned Katuman, who dropped his sword and fled, wanting nothing to do with that bad juju. Conan used the Sword that Conquers All to destroy the Helgor. Zula's illusion was soon exposed, but Conan and his allies were able to escape. Zula beaned Katuman with another skull before they left. (Savage Sword of Conan#2/Conan the Barbarian I#249 - BTS) - Katuman, having joined up with Natohk's forces, encountered Conan again during the final confrontation against the forces of Khoraja. After Conan had been knocked off his horse by a hurled mace, Katuman rushed forward to try to brain him with a rock. Conan managed to take only a glancing blow, and then stuck his knife into Katuman's side. (Conan the Barbarian I#250) - Katuman, a prisoner, was brought into Khoraja. He was quite indignant that he had to ride in a cart next to a corpse. Conan told Katuman that if he were in his position, he'd long since have memorized Khoraja's Oath of Allegiance. 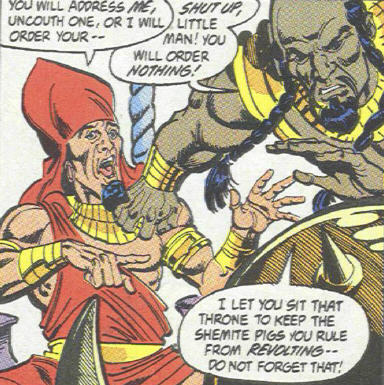 (Savage Sword of Conan#3) - Apparently having taken Conan's advice to heart, Katuman did swear allegiance to Khoraja, and his royalty granted his freedom within the castle of Khoraja. When Conan left to free Khossus, the rightful king of Khoraja, Katuman entertained Princess Yasmela with tales of his native Stygia. In a short time period, the two became engaged. Despite Conan's saving her nation and freeing its King, her brother, Yasmela chose Katuman over him--for his royalty. Comments: Created by Robert E. Howard. Adapted by Roy Thomas and John Buscema. Red Sonja and Zula were ret-conned into the struggle against the forces of Thugra Khotan in the Conan the Barbarian issues. The Shemite ruler of Yamman, his authority was usurped by Katuman, who dominated him by fear, but allowed him to maintain the illusion of leadership, to keep the Shemites who followed him in line. Irruk finally strapped a pair on, tripping and then mocking Katuman as he fled from the seemingly headless form of Zula. Irruk then rallied his people against Katuman, forcing him out of Yamman.